It may seem ironic that a firm whose roots are in the world of science and technology took the name of a field of inquiry that has been called “pseudoscience.” For us, the reason for choosing the name “ALCHEMY studio” lies in the parallel nature between the inquiry process of alchemists and the process and outcomes of planning and designing museum, science centers, experiences and media. The field of alchemy was a complex, multicultural and integrated way of thinking and exploring our world. 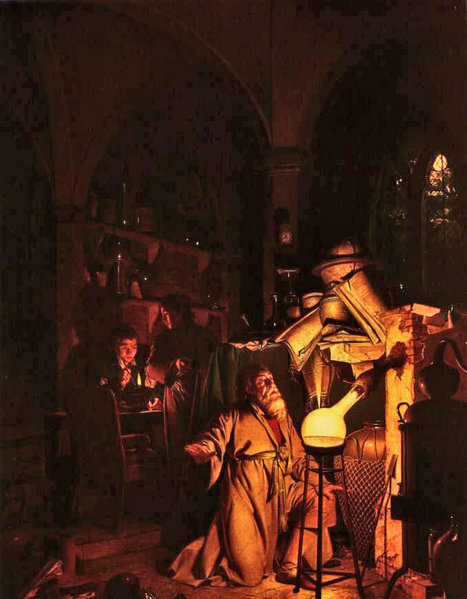 It included developing experimental processes and was a proto-science for the fields of chemistry and metallurgy. Meanwhile, alchemy also undertook seeing its examination of the physical world hand in hand with improving one’s spiritual self and seeking self-improvement. Of course, the most familiar “magical” aspects of alchemy are the practitioners who searched for the ability to transmute common metals into gold and silver, and the quest for an elixir of life that bestows immortality and youth. When one looks back at alchemy’s heights, it marked a special time (and perhaps the last time) when mythology, science, technology and spiritual worlds merged. Upon reflection of the what, why and how of what ALCHEMY studio does, the work of alchemists definitely resonated. Of course, most striking is that all work related to developing and designing experiences is aimed toward producing something magical, something that connects emotion and content. In practice, we are taking various “common” elements – lighting, displays, media, interaction and the visitors themselves – and transmuting them into something extraordinary, something that often makes us young at heart. ALCHEMY studio embraces the idea that we are alchemists. Perhaps you are an alchemist, too?